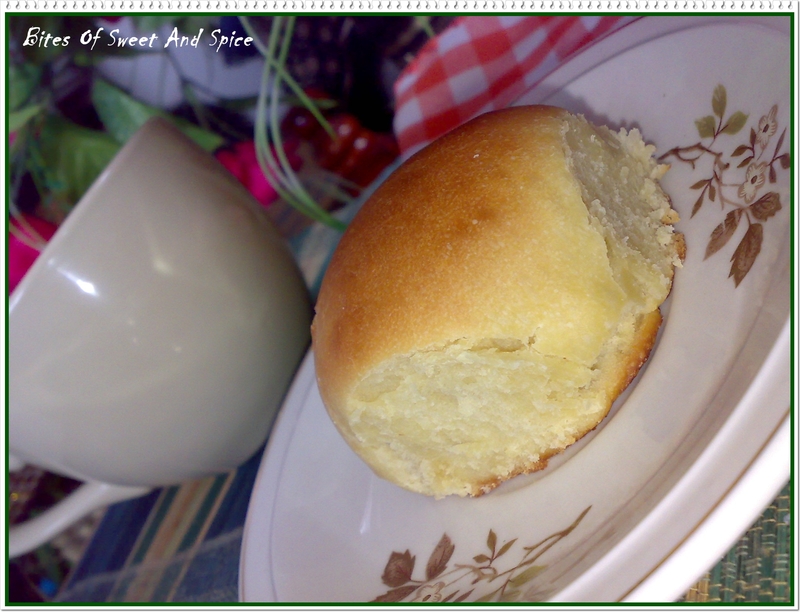 ← Some Sweet Buns… And A Good News! MMMM… Who can resist warm sweet buns fresh from the oven? 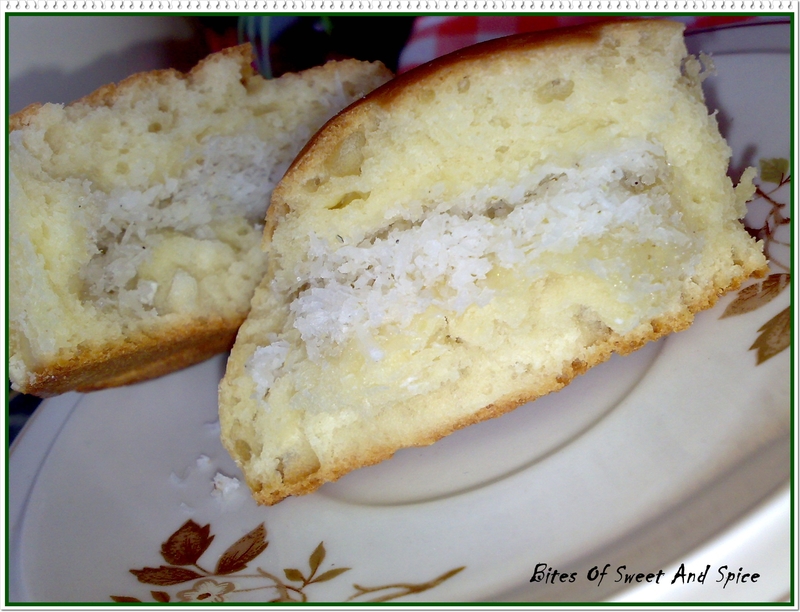 And what if as you bite into one, you find a delightful coconut filling inside? 🙂 That’s something to die for! Having successfully made pizza dough from scratch, these sweet buns were my second adventure with yeast. While I was very happy with the result on my first attempt, thinking back about it, I realized that I had to improve on it before I share the recipe here. 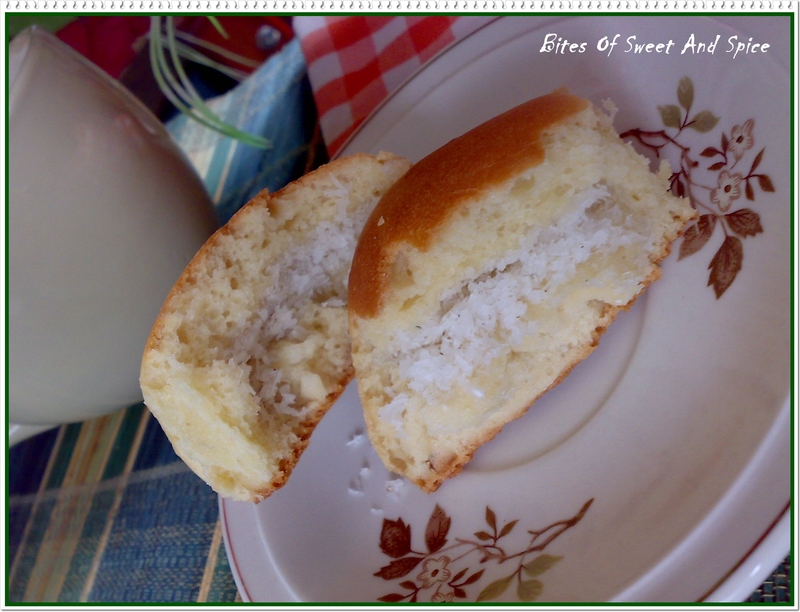 This time, I increased the sugar content considerably to make sure the buns are not bland in taste with just the coconut filling being sweet. I wanted the dough to be sweet by itself. I added some more butter and reduced the amount of water. The result was perfectly soft and fluffy buns! Take ¼ cup boiling water and ¾ cup tap water to make 1 cup. This would roughly equal the temperature of lukewarm water. In a large bowl, place the remaining 1/2 cup of lukewarm water. Stir in the yeast and 1 tsp sugar. Cover and set aside for 15 minutes until frothy. Then, add the milk – butter mixture to the yeast suspension. Stir in the sugar, vanilla and salt. (I skipped the salt since I was using salted butter.) Mix well till the sugar dissolves. Gradually add flour to yeast mixture, 1/2 cup at a time. Fold in until you have a loose ball of dough. Turn dough onto floured surface and knead well for 10 – 15 minutes. 3 ½ cup was enough to make the dough as well as for dusting during kneading. The dough might be slightly sticky but don’t be tempted to add more flour. Simply dust your hands with flour at regular intervals and continue kneading. Dump the dough in a lightly oiled bowl (the one you used for mixing above) and cover with cling film or damp towel. Let it rest in a warm place for 1 – 1 ½ hours or until doubled in volume. Dump the dough back on your work surface. Stretch it into a rectangle and then cut into 12 equal portions with a sharp knife. In a small bowl, combine ingredients for filling. Heat your oven at 50 degrees C for 5 minutes and then switch off. Flatten one portion of dough gently with your fingers. Place about 2 tsp filling in the centre. Pinch the edges together to enclose the filling and gently roll into a ball. Fill the remaining dough in the same way. 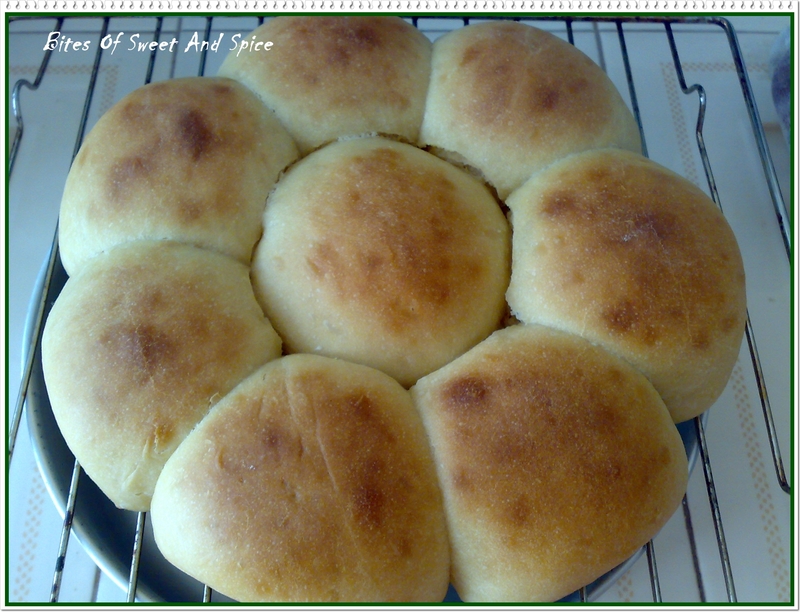 Place dough balls side by side on a lined or lightly greased baking tray / dish. Remove tray from oven. Preheat your oven to 175 degrees C while you brush the dough balls with milk. Sprinkle with sesame seeds or chopped nuts if desired. 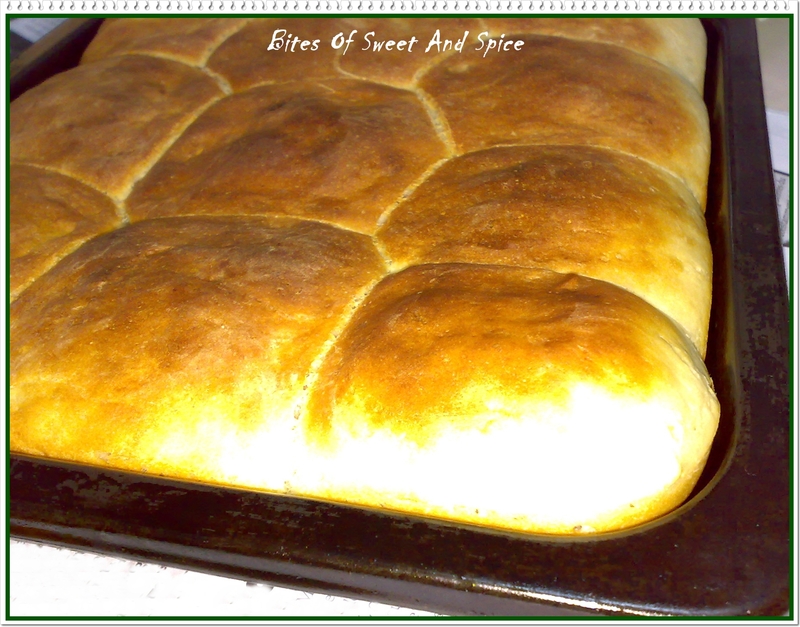 Bake for 20 minutes or until the buns turns golden brown. They should sound hollow when you tap them with a finger. Remove from pan and cool on wire rack to prevent steam from condensing at the bottom. This time I’m 100 % sure the Macatia Coco turned out perfect. 🙂 Enjoy these delicious treats at tea time or any time of the day! I know these seem like lengthy procedures, but I assure you the toughest part of the recipe is the waiting! Once you go through the recipe a few times, it won’t seem complicated at all. If I can bake these, you surely can! This entry was posted in Breads and Loaves, Coconut, Fruits, Pastries, Sweets and Candies, Snacks and Appetisers, Vegetarian and tagged Baking, Bread, Coconut bread, Mauritian, Rolls, Sweet buns, Yeast. Bookmark the permalink. This always makes me so hungry! 🙂 you should give the recipe a try! I’m sure you won’t regret it. Even I can’t wait to bake these again! 1 cup = how many grams? Hello.. Thanks for stopping by.. 1 cup flour should be around 150g.. Unfortunately I am not too familiar with the measurements in grams..